It was Wilson who, almost three decades ago, founded the Razzies as a sarcastic and satirical counterpoint to the high-minded Academy Awards, throwing a spotlight on the worst of the worst  the movies that, however noble in intent, arrived in theaters as a waste of time and money. The awards program matches the Oscars calendar step for step. Early on Jan. 21, precisely 24 hours before the official Academy Awards nominations, the Razzies will unveil their nominees for Worst Picture, Worst Actor and Worst Actress, as well as finalists in other unconventional categories including Worst Screen Couple and Worst Prequel or Sequel. (See this year's Razzie nominees.) On Feb. 21, the day before the Oscars ceremony, the Razzies will be announced at a special dinner in Hollywood. The first-ever Razzies ceremony  a truly improvised affair  took place in 1980. Wilson had recently completed film school at UCLA and accepted a job with a movie trailer company, where he worked on various films' media campaigns. The company had sponsored a film festival that year, and Wilson found himself forced to watch around 250 movies slated for competition. "When you see that many movies, the odds do not favor the stuff that the Oscars or Globes are talking about," he says, looking back on the hundreds of hours he spent wading through mediocrity. "The odds favor the opposite: it's far easier to make and finance, and therefore far easier to see, a bad movie." So where did the idea for the Razzies come from? Wilson blames attempting to host an Oscars party while living in the Pacific Time Zone. "The Oscars come on at five and are over some time around nine, and when you have that many people over, you have to have something to do, so I set up a cardboard podium and invited people to offer up nominees for the worst film of the year." The first Razzie statues were sculpted pieces of foam, and the inaugural Worst Picture award went to Allan Carr's Can't Stop the Music, a musical comedy that fictionalized the story behind the Village People. "I happened to pay 99 cents for a double feature of Can't Stop the Music and Olivia Newton John in Xanadu and was refused my money back afterward," Wilson says. The next year (when Mommie Dearest walked away with Worst Picture), the Razzies started receiving modest mentions in the local press, as Wilson distributed press releases to newspapers across Southern California. By 1984, major newswires started running the story, and the official Golden Raspberry Awards ceremony was scheduled for the night before the Oscars. "When we moved it to the night before the Oscars it suddenly became this big deal," Wilson recalls. "Part of it is that you have all this press in town for the Oscars from all around the world, and the night before the show, they really have nothing else to do." Some recipients have been happy to get in on the joke. 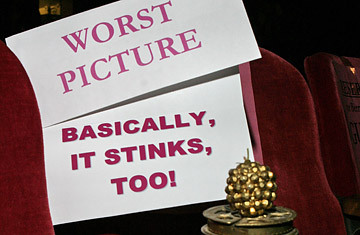 Showgirls director Paul Verhoeven appeared in person to accept the award for Worst Picture of 1995. ("He sat through the entire ceremony," Wilson says, "and then got up at the end and said, 'Obviously my film has entertained you, but not in the way I intended it to.'") In 2005, Oscar-Winner Halle Berry made headlines with an overemotional parody of her Academy Awards acceptance speech while taking home the Worst Actress award for Catwoman. Today, the Razzies are a year-round affair, with a website that attracts more than a million visitors annually with its picks for the worst films of the year as well as the worst movies of the week in theaters and on DVD. Nearly 700 voters  journalists, industry insiders and frequent filmgoers  now vote on the year-end awards. In conjunction with this year's awards show, Encore on Demand Movie Channel has scheduled a month-long tribute to past Razzie winners. Wilson says there's always been talk of organizing a Razzies telecast but due to the difficulty of getting usage rights to clips from the various films the awards are intended to skewer, he doesn't think a primetime Razzie Awards show will ever be possible. "There are some people in Hollywood who get the joke, but most just seem to hate it, and wish we would go away  which of course makes all this that much funnier," he says, noting that the Razzies are more a collective condemnation of a lazy industry than a poke at a handful of bad films. "For these movies to fail at this level, with these sorts of budgets and promotional efforts and this much talent involved" takes special effort, Wilson notes. "You look at a movie like Indiana Jones 4 and it's such a spectacular train wreck that it really does deserve recognition at some level." See the 100 best movies of all time.